Acreage Header Homes: Unique! 9 Acres Nursery Property in Naples with a 3/2 Residence and Office, Ideal for LANDSCAPER/ TREE/ IRRIGATION AND PEST CONTROL BUSINESS. Covered Garage for machinery storage and for vehicle parking, Irrigation fish pond and a large Inventory of a variety of Palms ready to Sell. Landscapers, Nursery Owners, Investors and Agricultural lovers don't Miss this Opportunity !!! Acreage Header Land: 157 acres of gorgeous Florida terrain with the freedom to roam. Unadulterated privacy rarely found in SW FL. The main house is built solid as a rock with a true cap rock facade and metal roof. The interior of the home boasts 3 bedrooms, 2 1/2 baths and large kitchen with antique cast iron baking oven that will make the people from antique roadshow jealous. The main living area is cut right out of a hunting lodge with wood paneled walls, open fireplace and a wood paneled vaulted ceilings that are truly impressive. Walk this property and feel the outdoorsman spirit come alive. The front portion of the property includes a fenced coral, 10 stall horse barn and concrete slab metal building to hold all your tools, toys and trucks. The main house has an additional 1.5 car garage. Various other structures on the property include a guest house, roofed workshop along the lake & additional pole barn. The small lake is a reported 60 ft deep and great bass fishing. Can you believe an airstrip also still remains intact at the rear of the property. The opportunities are abound and endless on one of the last remaining tracts of true Florida wilderness only 15 minutes to exit 101. Believe it! Acreage Header Land: Enjoy the privacy of country living on 40 acres, consisting of a 30-acre lake and approximately 10 acres of upland, only 20-25 minutes from downtown Naples and Gulf beaches. Ideal for an estate home, family compound or horses, or could be held for investment. The property is in close proximity to the Fiddler's Creek, Reflection Lakes, and the Naples Reserve master-planned communities. Developers, take note that the property is designated RMFU Receiving Lands and is eligible for TDR (Transfer of Density Right) credits to increase density beyond the AG (Agricultural) zoning allowance of one residential unit per 5 acres. Acreage Header Homes: Landscapers, Nursery Owners, Investors and Agricultural lovers this is your opportunity! Green Fields Nursery is on the market TURNKEY. The possibilities for this 9 acre lot are endless. This property is zoned for over 16 different residential and agricultural potential uses. The property consists of 3 parcels, with the option to separate. Each parcel can be developed with a residential home and a guest home. Conveniently located just off of South US 41, at the end of a dead end road with even more acreage for sale next door. The property consists of a fully updated 3 bedroom, 2 bath home; a 40X75 Workshop with air conditioned office fully insulated and 2 entry doors; a 50x50 mutli-use barn; multi-use tool shed, 2 pump houses, an irrigation fish pond, a full outdoor bathroom with shower, large area for parking boats, RV’s, trucks and heavy equipment. Not to mention the $250,000 worth of inventory of a variety of palms ready to sell! Inventory includes Pygmy Date Palms, Royal Palms, Christmas Palms, Canary Palms, Everglade Palms, Chinese Fan Palms and more. For a list of the inventory, details and a private showing, call today. Home, land and inventory are being sold collectively. Acreage Header Homes: GREAT LOT!!! no one expects to find a beautiful, natural area like this with a 2.39 acre lot on a quiet street West of Airport Rd, across street from Grey Oaks, the Coach House Ln area is adjacent to Estuary on south and RP Golf Club to west. It's an undiscovered street with privacy that comes when a lot is deep on a street that dead ends at an RP fairway. The location is convenient to shopping, restaurants, and, if desired, you can join the golf course of your choice without having to pay HOA or be restricted by their building expenses or guidelines. Your imagination is in charge....build small now then enlarge or go with everything such as guest house, stables, bocci court, large garage for car collection, resort style pool, large estate home on one level. Structures on property will need to be removed by Buyer. The house is being sold "as is" and will not be shown. The value of the property is wholly in the land. Acreage Header Multi Family: Excellent investment opportunity! Twin property, 2455 Thomasson, also available. Rare chance to own Four large 2 bedroom, 2 bath Duplexes, eight units in total, situated on 1.4+/- total acres. Located within the Bayshore CRA an up and coming boating and artist community. Close to Bayview Park boat ramp, Hamilton Harbor and Naples Botanical Gardens. 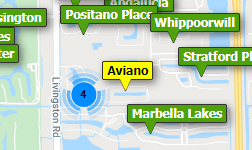 All within minutes of downtown and Naples beaches. Roof and HVAC's replaced in 2015. Terrific opportunity for increased revenue and future upside development potential. Current rent 875 on month to month. Market rent is 1200 per month. Many new developments in the area. See agents for details. Both PID 1 and 9 available at 499,990 each. Acreage Header Homes: If you like enormity...this is it! Rare opportunity to purchase an estate property, never before listed, owners passed away. Unlimited potential-beginning with 4.77 acres of residential, cleared and ESTATE ZONED property. Conveniently located approx. 2 miles outside of city limits and only 10 minutes to beaches and downtown Naples. Property has CITY WATER AND SEWER. HUGE 3,128 sq. ft. (92' X 34') Warehouse/Barn equipped with water, electric, 10ft doors and non-airconditioned. 2 car covered carport makes unloading vehicles safe and easy regardless of weather. TOP RATED school district. NO HOA. Home needs updating and TLC. It is live-in condition with working appliances and recently serviced central air-conditioning. PRICED TO SELL!! Property being sold AS IS with full rights to inspect. Acreage Header Homes: H.12909 Large 2 story home on a 1.14 acre fenced lot located on a private, very quiet, dead-end street, with mature landscaping. Master suite on the 1st floor with his and her closets and built in vanity in bath. Family room with wood burning fireplace opens to kitchen and screened lanai plus additional open lanai - Great for entertaining! Upstairs is a loft area with 2 large bedrooms with built in corner built-ins. Being sold "As-Is". Acreage Header Homes: Incredible piece of property and a rare opportunity to own a beautiful house + a 5 acre land at this price range. This remodeled 1921 SF house sits on over 5 acres of precious land. The house is beautifully remodeled. It is tiled throughout and features a new kitchen with Mahogany Shaker-Style cabinets, stunning back splash, creamy granite counter tops and Stainless Steel Appliances. Great split floor plan, Vaulted ceilings. Abundant natural light, custom lighting fixtures,new bathrooms, dining & living room, a Large Master bedroom with walk-in closet and huge shower! Plenty of parking in front of the home. The back yard is fenced in. No HOA fees or rules! Conveniently located near dining and shopping, and short drive to Olde Naples and Marco Island. Great opportunity to live in the city and experience the country living. Acreage Header Homes: H.13537 - Adorable Old Florida Cottage on 2.39 acres of mostly cleared land. This home has been completely updated with a new roof and hvac only 4 years old. Beautiful wood walls and flooring, updated kitchen and bathrooms. This home also has been professionally landscaped and has a detached, large storage shed, fire pit and plenty of open space. Located on Radio Rd and only a few miles to downtown Old Naples. A must see! Acreage Header Land: Property is fenced and zoned agricultural. Mobile home on property with electric, well and septic. Mobile home suffered damage after Hurricane Irma and is not being sold as livable space. Acreage Header Land: 20 ACRES: TWO PARCELS OF 10 ACRES EACH. TWO PID NUMBERS. THIS LAND AND THE SURROUNDING LAND LOOKS TO BE HIGH AND DRY. PINES AND CABBAGE PALMS. LAND USE CAN ONLY BE DETERMINED BY THE COUNTY, BUT MAY POSSIBLY BE NURSERY – BEE KEEPING – LIVESTOCK RAISING – AQUACULTURAL (NATIVE SPECIES ONLY) – RANCHING AND FORESTRY GROWTH. LAND SURROUNDING THIS PROPERTY IS BEING USED FOR GRAZING CATTLE – FISH FARM and LIVE STOCK/HORSES. BEFORE INVESTING, BUYER MUST FIND OUT FROM COLLIER COUNTY IF THE LAND CAN BE USED FOR THE PURPOSE THE BUYER INTENDS. Acreage Header Homes: AS IS INVESTOR SPECIAL CASH ONLY! Close to the highway yet you feel like you are in a secluded cabin in the woods! This 3 bedroom plus a loft for the kids home has 1 bathroom and a Beautiful Fireplace. Quiet 5 acres with a fenced in yard around the house. New well equipment installed after Hurricane Irma! Home needs some updating and TLC but where can you get a home with 5 acres under $150K in Naples! Acreage Header Land: REDUCED! Great piece of property, has a nice pond. Great kids playhouse with slide and swings. Firepit has been used several times for family gatherings. Only looking for a family to build their dream home in beautiful West Coast of Florida, desirable Naples. Acreage Header Land: GULF ACCESS VACANT RESIDENTIAL LOT. Only 3.5 miles from the beach and 5th Ave S. No HOA and located in the upcoming Bayshore Re-Development area. Great Investment to hold or to build your own home. LOCATION ! Hurry this opportunity won't last long. Need professional assistance selling your property at Acreage Header Naples? Find out how an Area Specialist can help to generate more property exposure in order to get the most money for your investment in the least amount of time.